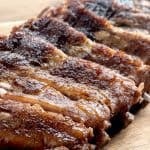 Flavorful spice blend, tender ribs, and no sugar! Add all spices to a small bowl and combine well. Using a knife, remove the silver skin membrane on the bone side of the ribs. Liberally season ribs with seasoning mix on both sides. Add one cup of apple cider to pot, along with trivet. Place both racks of ribs on top of trivet. Lock lid and cook for 20 minutes at high pressure. Transfer ribs to baking sheet and place under high broiler for 5-7 minutes, until desired char is achieved. Watch closely to prevent burning.